My target audience is male and females between 16 and 25 because I believe the Uk tribes groups I have chosen to target only seem to be in this age gap. This age group is being targeted also because they look for alternative music and are more diverse than older age groups making them more interested in my magazine. They would enjoy finding out about new music and fashion in my magazine, the age range I chose also seem to have a big percentage who look for alternative music and it is more of a popular pass time to this age range than to others. My target audience would go to concerts, festivals and gigs which is again something only 16-25 year olds tend to do regularly although 16 year olds may need adult supervision still. People that go to gigs and festivals would be interested in my magazine because it as information on the latest gigs and festivals as well as information on the artists themselves. 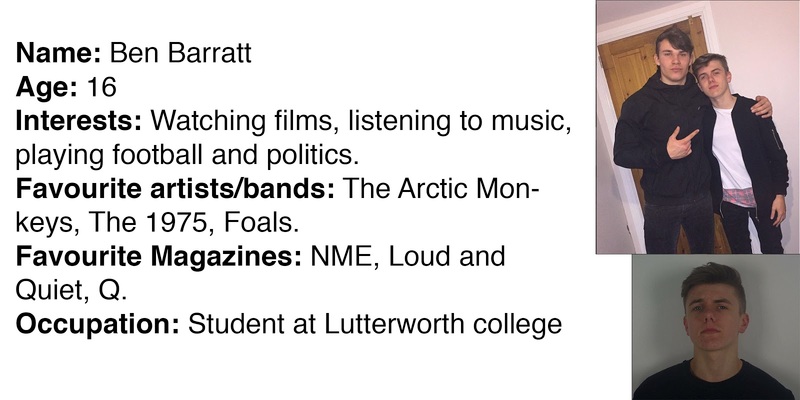 My age range ends at 25 because that is when most people tend to settle down and start going to less gigs and have less interest in the cutting edge music scene. I believe my magazine appeals to both male and female readers because the information is gender neutral and there is a variation of male and female artists and writers. Because my genre is indie/alternative my audience will definitely enjoy being/feeling different to others so they would enjoy reading about new artists. This also means that my audience may all have different styles so the magazine would have to vary the fashion a lot and make it it versatile in that sense. Due to the indie nature of the magazine and comparing to other magazines such as NME (£2.50) and i-D which (£6) I have decided to sell my magazine for £5. I decided to do this because of other magazine prices and because my magazine is quarterly which would greatly reduce income if I tried to compete with NME or other cheaper magazines. The complete styling and design of my magazine was influenced by the target audience. From my research I found they like a minimalist look and for fashion they preferred an alternative look. 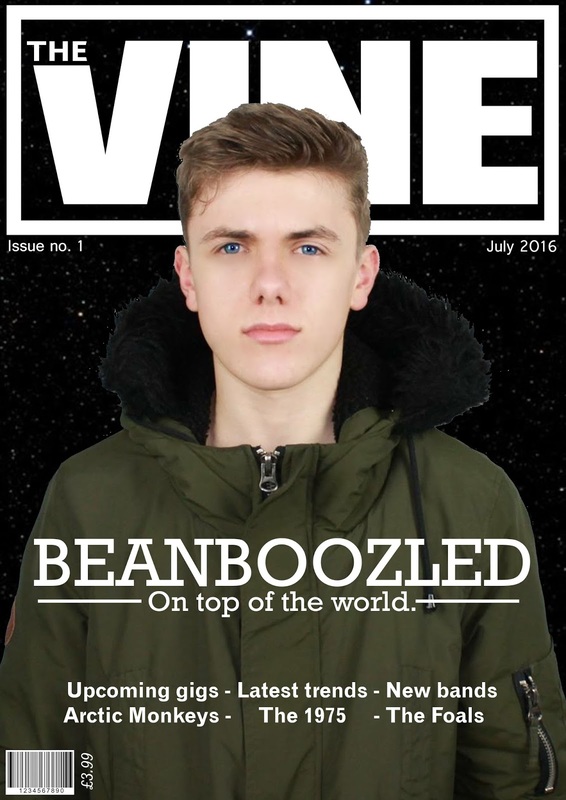 This is why I dressed my artist 'Beanboozled' in an indie parka coat which would appeal to most of my audience. I also used a minimal style while creating my magazine because I found that is the most popular way for presenting indie magazines that appeal to the target audience. I have made profiles for two possible readers and asked them questions as they would be the average people in my target market. What would attract you to my magazine if it was in a shop? Ben - The big bold masthead would draw my eye and the subtitle would then get my attention because the font is interesting. It would then have my attention and I would read the rest showing me whats inside and possibly persuading me to buy it. Elliot - The picture of the artist on the front, the intense eye contact would draw my eye and make me look at the magazine because I would be intrigued and want to know whats inside the magazine. What kind of artists and bands would you like to see in this magazine? Ben - Honestly it doesn't bother me I just want to hear new music which is different to the norm. Anything that is new interests me whether they are a band or an artist. 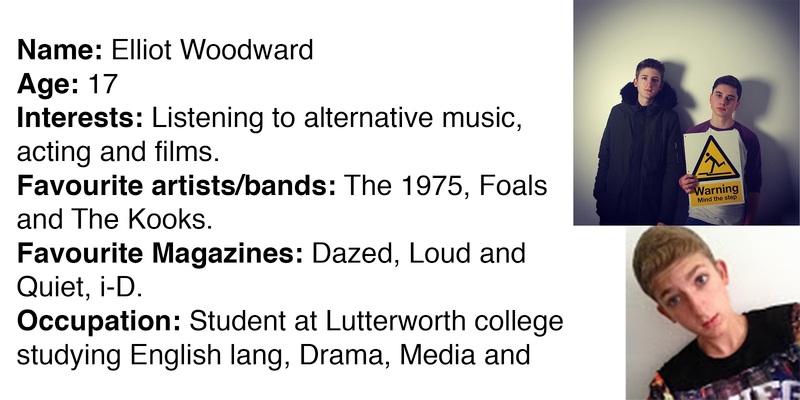 Elliot - I tend to prefer bands because in the indie genre they are more interesting and tend to push boundaries more. I would prefer to see more bands for that reason. Is fashion a big part of why you buy a magazine too or not? Ben - Yes I always want to know what the next thing is and what is in fashion with popular bands and artists. I get most of my style from different artists because they always wear interesting new clothes. 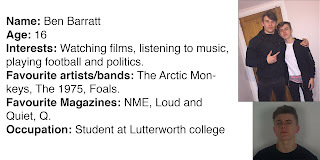 Elliot - I am not very bothered about the fashion I just care about the new music however I still enjoy it I just would not buy a magazine for it. Remember to specify your target audience (teens will not do). Try and add a few more questions to ask your target audience.